Well, it has been a very difficult month, but the Bird of the Month collection for June is finally ready! Better late than never, right? Because of the many requests for Galahs over the past few months, I decided I HAD to go with this lovely bird this month. 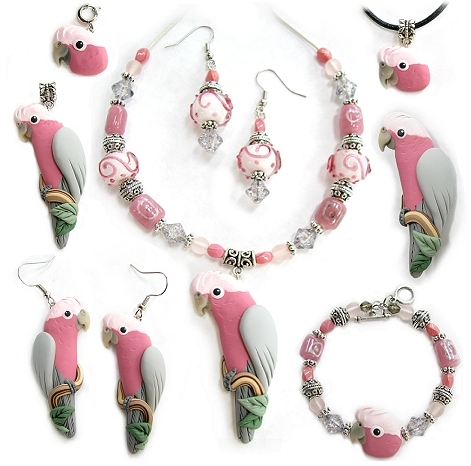 I have posted a large collection of Galah / Rosebreasted Cockatoos for auction on eBay this week, which include a bracelet charm, choker, pendant, pin, glass bead necklace sets, beaded bracelet as well as a pair of full body earrings! There are actually two glass bead sets available this week, one with silver beads with the bird created in a brighter pink, and one with gold beads with the bird created in paler colors. The items will be available for the next 6 days on eBay, so go take a look if you have been waiting for this species! Also new on eBay this week is a Hahn's Macaw choker, as well as a Congo African Grey glass beaded necklace/earring set in a black and white theme with polka dots and stripes - fun! To see the complete list of items currently on auction, go to my EBAY listings. It is with tears that I write this sad entry - we've lost our dear doggie friend Buddi. He was almost part of the family and we all loved him so very much. Sadly, he suffered from a fast growing brain tumor. Buddi was such wonderful dog, and quite a fighter to put up with so many treatments, his family did everything for him. It's been a long and difficult battle. He was let go yesterday and is at peace. Our thoughts and prayers are with his family as they grieve his loss. Teddy, Maisie, Maggie and I will forever miss you Buddi! I wanted to let everyone know about an online auction that will be held from June 25th through July 2nd to benefit the evacuated animals of the devastating Cedar Rapids flood. The website is located at: www.iowafloodreliefauction.com - please stop by and view the photos and stories of the many people and pets affected by the flood. It's amazing how life for so many people can turn upside down in such a short time. My city of Cedar Rapids, Iowa, suffered severe devastation from record breaking floods over the last week. (If you missed coverage on the news, you can view a great deal of footage on YouTube.com by typing in "Cedar Rapids Flood".) It is a difficult time and sad to see so much loss all around, yet we are so thankful that there are have been minimal injuries or deaths. Thanks so much to all of you that emailed and called to check on me after hearing about the disaster on the national news - I am a bit shaken, but safe and sound! I personally have SO very much to be thankful for, besides the most important fact that my family, pets, and friends are safe, that my home was safe from the flood water. We are thankful to have electricity and phones working and had wonderful news yesterday that the city water is improving capacity so this is going to be a huge help in getting everything a bit more normalized. Thank you for your thoughts and prayers, I really appreciate it! Progress - slow but sure! I'm finally seeing the "light at the end of the tunnel" from the massive overload of custom orders I received back in January. :) It has felt like a never ending line for so long that I am so excited to finally feel like I am catching up. Slowly but surely, I'm getting there, and I'm shooting for another opening in 1-2 months hopefully! Stay tuned through my newsletter to be informed when I plan my next limited opening. Below is a custom order finished from yesterday's work.